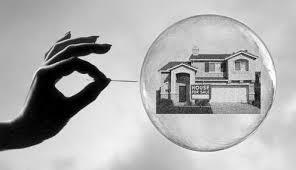 I will be writing a series of articles in different publications on why I think we are heading for another housing bubble. But more importantly how we can fix our housing market, the largest asset in the world, long term. As the government and industry continue to push real estate and home ownership I think it’s important to lay out an opposing viewpoint and data that correctly illustrates the risks consumers are facing. Below is a simple overview and charts on why I think we are heading into another housing bubble. 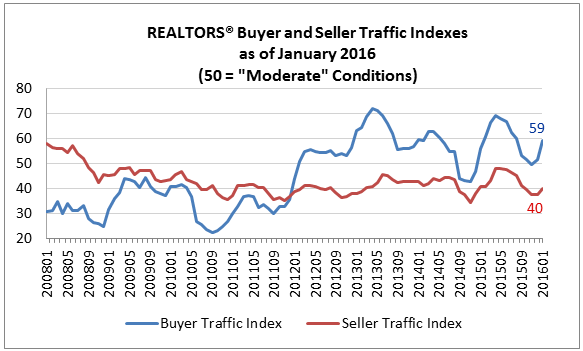 I think the appropriate starting point is the supply and demand mismatch in the housing market, there are more buyers than there are sellers (Chart 1). This is a point I think everyone agrees on – we have a shortage of supply. But why? The real estate industry will tell you that building homes lags demand which in many cases is true but not in this instance. 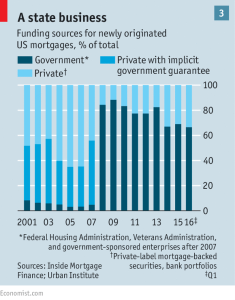 Since 2008, the government has nearly nationalized home mortgages (Chart 2). In doing this the government is falsely pricing loans by subsidizing federally backed mortgages in the tune of $150 billion a year from tax payers. This allows the federal agencies to drive out accurately priced private loans from banks and create demand for consumers to buy homes. The motivation is to drive home ownership rates and why there is false demand in the market due to mispriced credit. If you are hearing that lending has tightened that is not true and it shows in the data. There are still loans being issued with less than 5 percent down payments and home equity has barely increased since 2008 (Chart 3) which is indicative of loose credit. This subsidization and nationalization of home mortgages is driving false demand. What does that mean? Supply will not catch up with demand due to banks not lending on construction and development loans at the level the market demands (Chart 4). Why? Banks have to price risk appropriately since they are not subsidized by taxpayers like the home mortgage industry is now. 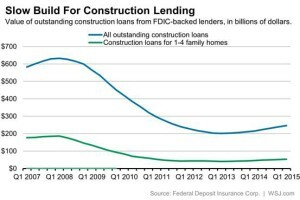 This supply and demand issue is a mismatch in risk between government subsidized loans driving down rates/fee’s resulting in increased home mortgage supply and accurately priced non-subsidized construction loans by banks decreasing new construction supply. Supply will never catch up with demand in this scenario and government will continue to loosen credit to drive home ownership rates which is at a fifty year low. This mismatch in credit pricing between developers and borrowers is driving up home values artificially. So what will happen? 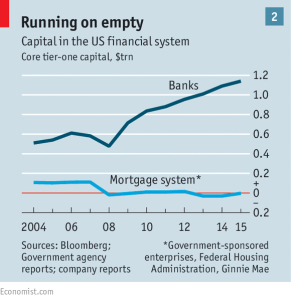 Since 2007, new legislation required the banks to increase their reserves to appropriately handle risk in a downturn. 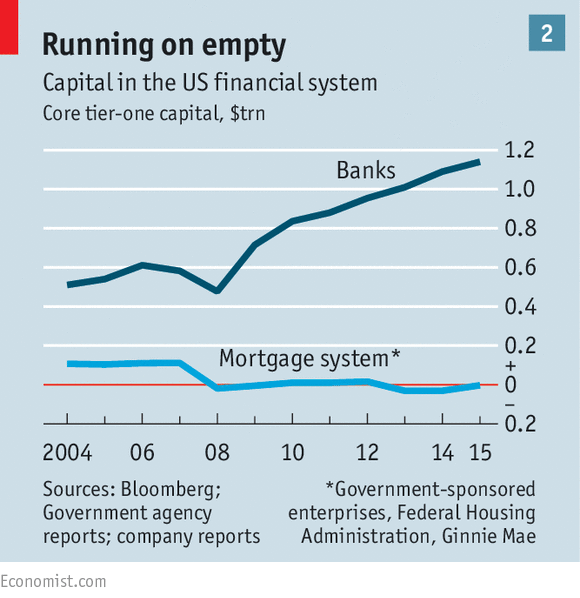 The banks have doubled their reserves since 2007 from $600 Billion to $1.2 Trillion but there is one problem. 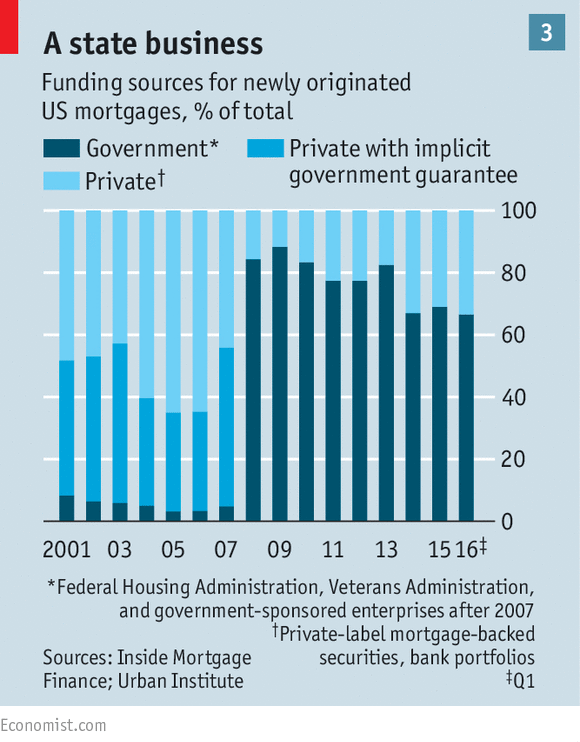 The federal agencies are now controlling the home mortgage market and are not required to have reserves (Chart 5). What will this create? On the current path the mispriced loose lending of the government on home mortgages matched with supply constraints due to banks tightened lending on construction will falsely drive up home values. This is evident in the data we are seeing. If credit continues to loosen (low equity requirements, artificially low rates) and loans are mispriced this will eventually and inevitably lead to another bubble and correction. Also keep in mind that we are seven years into the slowest recovery in modern history, its only a matter of time before we see another recession and correction that will wipe out the low home equity values. But this time there are no reserves with the majority issuer of home mortgages, the federal agencies, and the Economist predicts this will cost tax payers in the range of 5% to 6% GDP (approximately $500 Billion). The market corrects mispriced credit one way or another, it just so happens we do this on back end with home mortgages in the form of tax payer bailouts. The silver lining is the fact supply will be limited due to tight construction credit but matched with little to no reserves and we are still headed to a similar amount in bailout long term. This is why I will not buy real estate and choosing to be an opposing voice to what the real estate industry and government are telling consumers about home ownership. 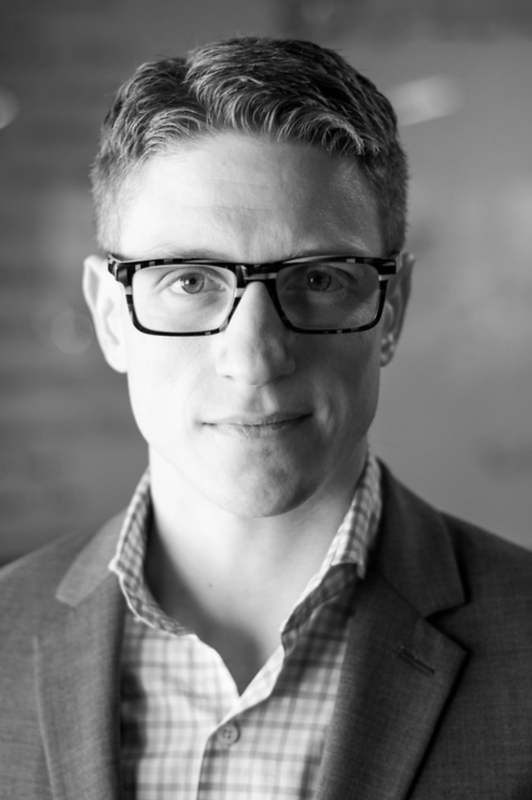 I have zero skin in the game in the real estate industry. I am posting this research and my thoughts due to a philosophical issue I have with how government misprices risk and how a small percentage of thought leaders that know the facts are misleading consumers on the risk associated with the current housing market. I also do not want to see my family and friends lose their hard earned money due to this manipulated market. I encourage all of you who own real estate or looking to buy real estate to really dive into the details and do not take the government or real estate industry at face value. I will end with a final point on real estate as an investment. The real estate industry will tell you that on average your home will appreciate 1% per quarter and 4% per year but this is misleading data. When adjusted for inflation real estate value has nearly no real appreciation since 1890 (Chart 6). A home is valuable as a form of shelter but it is not typically a good investment. 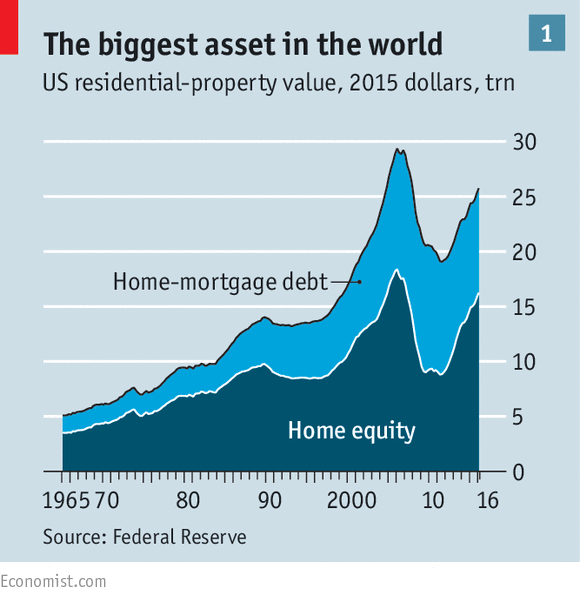 In 2014 in these pages, the great financier Michael Milken cited research going back to 1890 showing that the annual inflation-adjusted return on houses was barely above zero. “Factor in real estate’s heavy transaction costs and that number turns negative,” Mr. Milken wrote, while stocks over the same period enjoyed a real average annual return of about 6%. Housing is best understood in economic terms as a form of consumption, not investment.